Ultimate performance meets great style with the girl's Splasher Short Sleeve Top from Columbia. This shirt features Omni-shade UPF 50 sun protection as well as having Omni-wick advanced evaporation. Ultimate performance meets great style with the girl&apos;s Splasher Short Sleeve Top from Columbia . 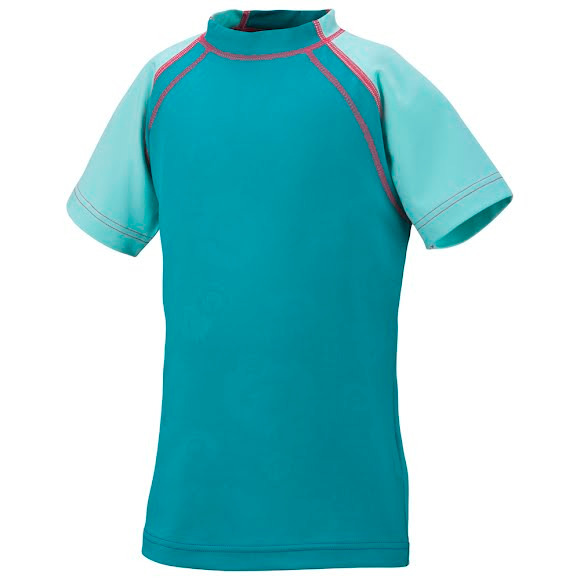 This shirt features Omni-shade UPF 50 sun protection as well as having Omni-wick advanced evaporation. This moisture transferring technology moves and disperses sweat away from the body for quick evaporation, keeping you comfortable during physical activity. UPF (Ultraviolet Protection Factor) 50+ fabrics protect you from 97.5% of the sun&apos;s harmful ultraviolet rays. Columbia&apos;s UPF rated clothing is specifically designed and tested to be comfortable in the hottest conditions incorporating design features such as mesh, venting and lightweight fabrics.